When I woke up this morning I was greeted with all sorts of good news. Some of it I can share with you now and some of it will have to wait. First my sister is home from the hospital and doing well and that is good news indeed. 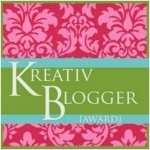 Then when I opened my blog this morning it was to find this “Kreativ Blogger” award from Jane at They call me Jane. I am so honored she thought of me, thank you Jane. 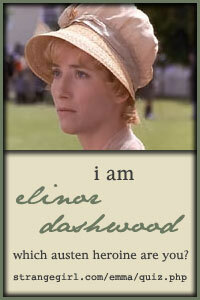 She is a wonderful writer whose blog I read everyday. She is witty and funny and shares her life in such a way that makes you feel like a friend. Go see Jane, you will be glad you did. I am going to give it to Ink over at Inktopia who always keeps me on my toes and makes me think with her post. It also helps to keep a dictionary handy. Ink never fails to amuse and astonish me with her plethora (see I do learn) of knowledge. 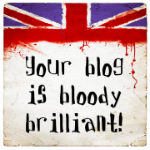 I would also like to give the award to Kate (formerly Life in Italy) over at E ORA her new blog to welcome her to the WordPress community and because I just love her post. Give Kate a little bloggy love and maybe she will tell us what E Ora means. Finally I would like to give the award to Michelle at Aimless Topics who is new to blogging but has a voice I would like to encourage. Her writing is creative and honest. Part of the Kreativ Blogger Award is I need to share seven random facts about myself. What! only seven, my whole life seems so random. 1. I married my high school sweetheart in Las Vegas at 1 am. 3. Disneyland and I are the same age. 4. No one wants to play “Trivial Pursuit” with me because I win. 5. I like Opera but have never been to one. 6. I’m a Dallas Cowboy fan. 7. I think Dr. Pepper is better than Coke a Cola. I know, I know, but I do so simmer down ya’ll. This entry was posted in blogger spotlight, uncategorized and tagged awards, blogging, blogging awards, blogs, children, family, funny, general rants, hot topics, kids, life, love, marriage, mom blogs, moms, motherhood, my life, opinions, parenthood, passions, passions and soapboxes, soapboxes, writing. Bookmark the permalink. 15 Responses to Recognition Is Nice…. Thank you SO much, Robin; I’m honored. You are so sweet! I didn’t know you liked Dr. Pepper Ink. Yea! I am not alone. Oh and hooray on your sister’s homecoming! What about the miracle whip….. Grape Jelly….. On a toasted cracker…..or the fact that you drink tall glasses of milk full of ice. I think these are interesting….. I didn’t want to gross them out too bad. Oh the milk, I miss the tall iced milks. I started doing that in the hospital when you were born, you know. Can’t have all that milk anymore. Thankyou, thankyou, thankyou – I had just been lying in bed having bad blogging thoughts – and then I logged on and found this – starting a new blog is much harder than I expected – I feel a little lost – so getting this award from you has really put a smile on my face :)) Oh, and I think the 1am wedding in Las Vegas is sooooo cool! I’m glad it cheered you up. You more than deserve it, I love your blog. Awww how sweet. Thank you so much ! I love your blog you always make me smile I’m happy to know that you like mine too. Such sweet things said about me when it is YOU who deserves the accolades! 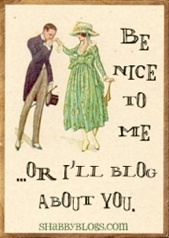 You’re too kind and I love your blog, too! And I love your random facts (and the fact that your daughter called you out on a few!). I love Opera, too, and you absolutely MUST go to one. You must! To experience it live is like nothing else. But Dr. Pepper over Coke? You already know how *I* feel! Congrats on the award! I can’t wait to check out the new blogs you mentioned. And as for the opera…GO! I love opera and have been to several, even dragged Hubs to two. He does not like opera, but appreciated the productions. I, meanwhile, sit there in heaven! I’m jealous! Josh and I wanted a Vegas wedding but my mother in law threw a wrench in that plan…but we are planning to renew vows in Vegas for our 10 year! With you on #7 DP rocks! If you like Hazelnut you should try mixing a little syrup in with it, tastes awesome! Look at you and your rockin’ Vegas wedding!! How cool is that? And I love me some Inktopia…good choice!! And I knew there was a reason I loved you.